« Virginia Residency Program Provides Full Barns, And A Future. The list of top Virginia breeders by 2017 purse winnings has been announced, and horses bred by Mr. & Mrs. C. Oliver Iselin III led the way with $934,958 in earnings. Their American Dubai kicked off the year with four straight wins at Sunland Park and by year’s end, had bankrolled $332,310 from nine “in the money” finishes. Other top Iselin-bred performers included Hold Me Black ($63,856), Swordfish ($60,654) and Drop Dead Red ($42,870). Sadly, Mr. Iselin passed away in November. Stellar Wind, 2017 Virginia-bred Horse of the Year and Champion Dirt Mare, scored a natural hat trick with three consecutive Grade I stakes wins last year in the Apple Blossom, Beholder Mile and Clement Hirsch Stakes. Those triumphs equated to $800,000 in earnings and allowed her breeders — Peggy Augustus’s Keswick Stables and Stonestreet Thoroughbred Holdings LLC. — to finish in second place with $801,200. 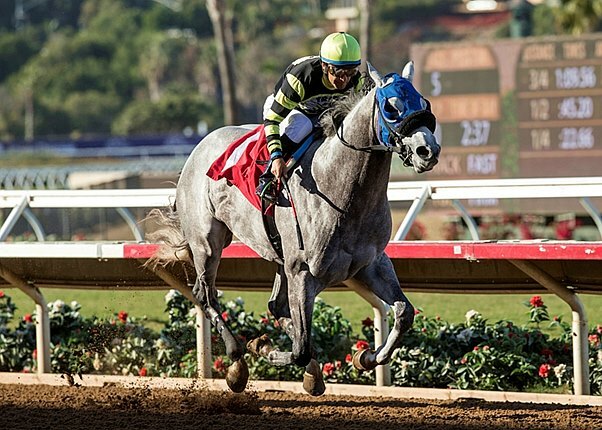 Greyvitos went gate- to- wire in the Grade 3 Bob Hope Stakes at Del Mar. Photo courtesy of Benoit Photo. 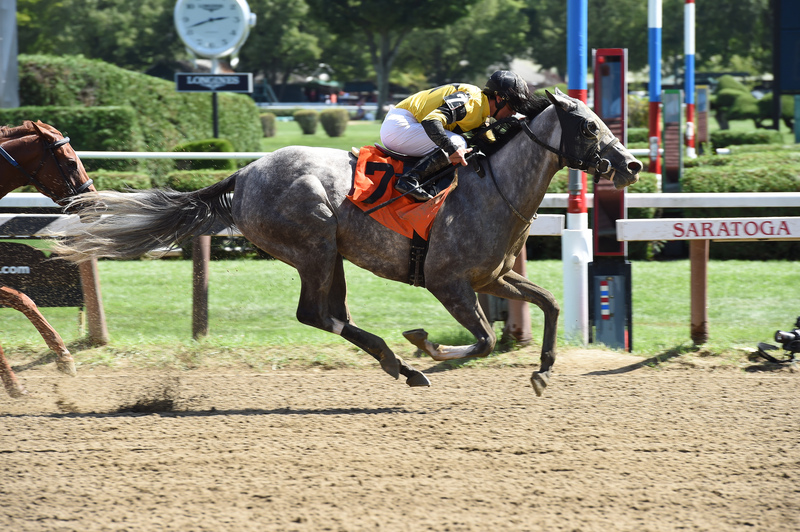 Audley Farm was third thanks to a breakout campaign from Greyvitos, who positioned himself as a 2018 Triple Crown trail contender with a win in the Remington Springboard Mile. Combined with a victory in the Grade 3 Bob Hope Stakes, the Malibu Moon colt completed the year with $306,345 in earnings. Other noteworthy horses were Simmstown ($57,513), Unpredictable ($48,520) and Aljuljalah ($43,695). In all, 15 Audley horses combined to win $694,256. Morgan’s Ford Farm, who finished fourth in the standings, bred a trio of $100,000 earners last year. Ring Knocker ($199,666), Queen Caroline ($115,318) and River Deep ($119,300) combined with 18 others to earn $654,065. Ring Knocker captured the Xtra Heat Stakes, Queen Caroline prevailed in both the Broomkmeade and Nellie Mae Cox Stakes and River Deep, who was co-bred by F and F Stable, won four straight races last fall at Laurel. Ring Knocker won a a $90,000 race at Saratoga September 4th. Photo by Adam Coglianese. A pair bred by Mr. & Mrs. Bertram Firestone also hit six digits in earnings to help them finish fifth in the standings. Northern Eclipse ($146,635) won the Camptown Stakes and had 9 “top three” finishes, while Special Envoy captured a Virginia-bred stakes in each of the three special Commonwealth programs at Laurel. The 7 year old Stroll gelding was best in the Edward Evans, Bert Allen and Hansel Stakes. Other top Firestone performers like Armoire ($72,390) and Dapper Dan ($55,500) contributed to their $586,0127 total. The William Backer Revocable Trust was next with $511,754 thanks to a number of consistent showings. Ten of their horses earned over $20,000 and interestingly, the two highest earners never reached the winner’s circle last year. Chorus Line ($70,865) had six “in the money” finishes between New York tracks and Monmouth while Divine Interventio had five straight second or third place finishes on the New York circuit as well. Other top Backer horses were Buckys Pick ($54,430) and Going Rate ($34,416). Rapid Rhythm, bred by the Lazy Lane Farms, LLC, won the Oakley Stakes at Laurel last fall. Photo by Jim McCue. Six horses bred by Lazy Lane Farms won $39,000 or more in 2017. Rapid Rhythm ($77,094), Lenstar ($72,273), Carbon Data ($66,380), Sweet Sandy ($56,962) Sambrook Edge ($47,390) and Cryptos’ Holiday ($39,300) all chipped in toward a $456,537 total figure. Rapid Rhythm won a pair of stakes at Fair Grounds — the Mardi Gras and Richard Scherer Memorial. A dozen horses bred by Larry Johnson earned over $15,000 last year, topped by Do What I Say ($51,935) and Magician’s Vanity ($48,590). 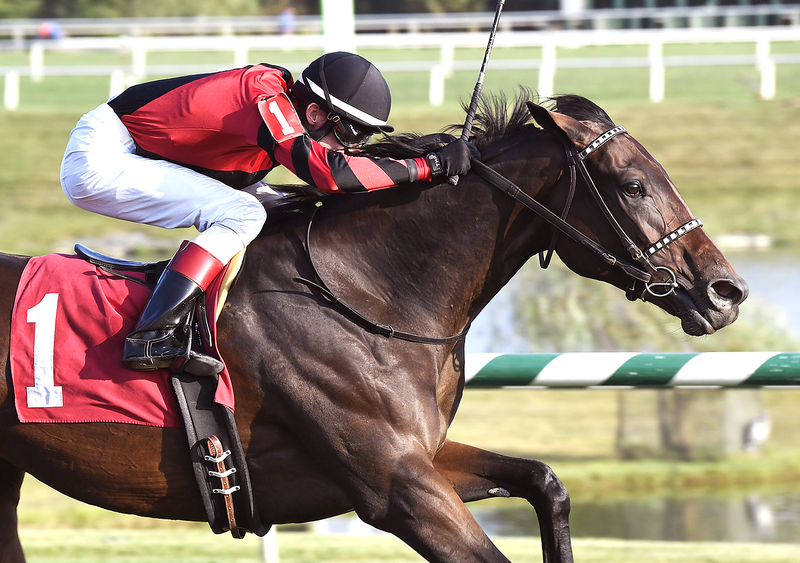 The former captured the Tyson Gilpin Stakes at Laurel while the well traveled latter horse bagged a win at Laurel, two runner-ups at Saratoga and a second and third at Gulfstream. 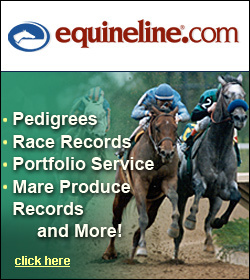 In all, Johnson-bred horses earned $391,333. 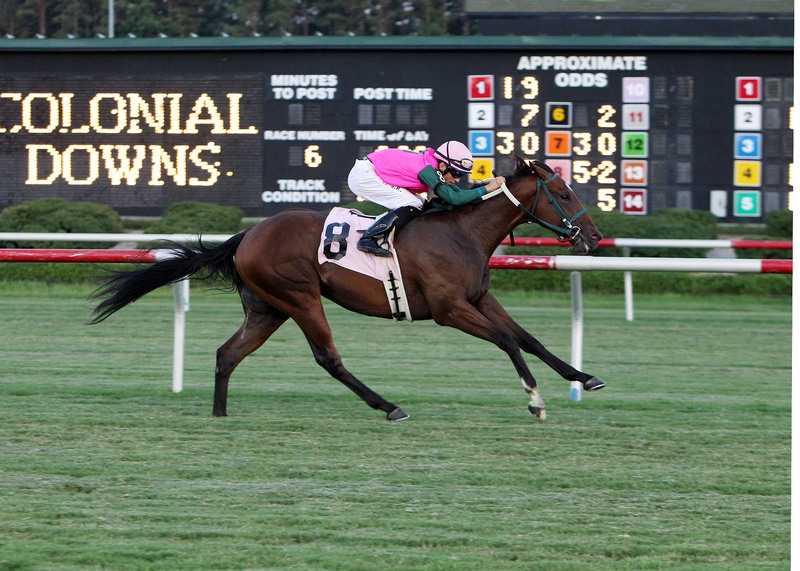 Long On Value wins the Jamestown Stakes at Colonial Downs as a 2 year old in 2013. Courtesy of Coady Photography. Snow Lantern Thoroughbreds ($306,485) and the Estate of Edward Evans ($284,849) round out the list of top breeders. Snow Lantern’s Long On Value did not gain a win last year but did bankroll $302,225 from solid efforts at Woodbine, Saratoga, Gulfstream and Meydan Racecourse. The Edward Evans-bred Code West earned $149,700 from a triumph in Zia Park’s Veterans Stakes and from another six stakes where he finished fourth or better.